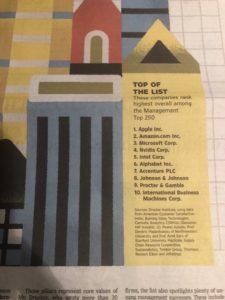 December 3, 2018 | Robert Handfield Ph.D.
Today’s WSJ featured the list of the top 250 companies, a landmark ranking that uses the principles of the management guru, Peter Drucker to identify the most effectively managed companies. The list is a function of 37 different indices, that are a function of a series of “practices” as described by Rick Wartzman, director of the KH Moon Center for a Functioning Society, a part of the Drucker Institute. The rankings are designed to reveal how effectively each company is managed, along five major dimensions . Innovation Financial Strength, Social responsibility, Employee engagement and development, and customer satisfaction. 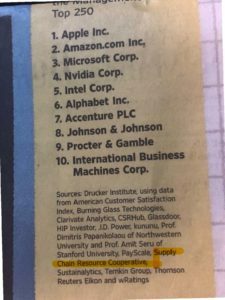 As shown on the front page of the WSJ article, the authors reference the source of the indices used to form the list, which segments the top 250 companies out of a list of 750 total. Look carefully, and you’ll see…. the Supply Chain Resource Cooperative! 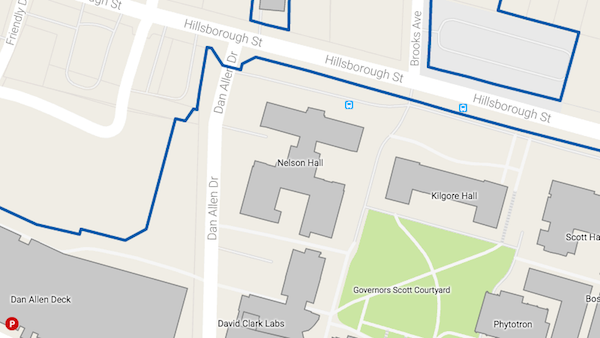 We are proud to be part of this effort, as it represents yet another view of how research conducted at NC State is being applied directly to practical outcomes in the world of supply chains. The Supply Chain Resource Cooperative has been engaged in its supplier relationship maturity model, which includes evaluation of Fortune 500 companies and their progress towards both a) environmentally conscious supplier management, and b) adherance to the UN International Labor Organization guidelines around human and labor rights in the supply chain. The latter is particularly important for companies who source in low cost countries, and this has been a major focus for our work over the summer as we partner with VF, Nike, and the Global Fund to End Modern Slavery to assess labor rights in global supply chains. Prior work by NC State MBA students in a summer class I taught on environmentally-conscious supply chains has yielded substantial insights into who are truly leading companies in a number of different sectors. In addition, work by PhD student Yung-Yun Huang has been utilized Machine-Based Learning algorithms to scan third party news feeds, assess corporate commitment to sustainable supply chain principles, and evaluated the entire set of Fortune 500 companies on their progress towards truly sustainable supply chains. Two of these indices, which are updated every year, were used as input into the 37 data inputs used in the Wall Street Journal’s inaugural “Management Top 250” ranking of companies, published recently, and highlighted in this article. The SCRC ratings focus on several key issues, including environmental sustainability in supply management, as well as effectiveness of supplier relationships, and promotion of human and labor rights in the supply chain. Incidentally, the top 10 companies in our list is slightly different than the Management 250 list, although Microsoft and Apple both also appear. We are excited to be part of this initiative, and look forward to contributing to this index in the future.